Welcome, one and all, to a girl’s opinion on which pixilated characters in Summoner’s War are the hottest. This top 10 list will be listing who I found to be total eye-candies and will explain why. When a monster is mentioned, only that monster is considered to be hot by me, and not his whole family. We’ll also be judging them based off of their skillset. Please keep in mind that all of these are my opinion, and you can find the monsters I find hot to be ugly or vice versa, and with that, let’s begin! This monster is a sort of mixed bag for me. In certain scenarios, I really do find him crazy attractive, but in other scenarios, he’s probably “meh” at best, which is why I put him on the bottom of this list. Any other time, I just feel nothing towards him. I’m not sure why, it probably is that crazy hair (seriously, I think it rivals Jimmy Neutron’s hair) The only reason why I’m not excluding him from this list is because his skill set is basically super overpowered and awesome, and I’ve wanted this guy for months now before finally receiving him one fateful Monday. Also, is it just me, or his transmogrification terrible? His piercing blue eyes, the rest of his face hidden by his hair, and his blonde hair are all “yes” for me. It’s also probably just me who thinks that his skill set actually looks pretty good. I’m just going to sit here and contribute to the horrible new fad that is “13-something year old girls falling in love with vampires and making them super handsome and sparkly” It’s also around here that these monsters fall into the “if I weren’t already happily married to Mettaton, I’d be their girlfriend” territory. Look at that fine attire of Verdehile’s; those handsome eyes, that devilish grin, it’s just…UGH. Unfortunately, I am cursed with the fact that I am not lucky enough to have this handsome Vampire, but that won’t stop me from writing him into fanfiction where I make all the girls fall for him. In my humble opinion, his transmogrification is one of the best ones in the game so far (Next too, of course, the Demon’s Way Samurai) He is most definitely a monarch of death because my heart can’t love a monster design any more than I already do with this pretty Vampire. I only put him at number 8 because I honestly found a bunch of other guys that I like a lot more than Verdehile. To all you Verdehile owners out there and reading this: You are lucky, lucky! Sorry, Charlotte, but I find your cousin quite the attractive one. The archangels’ appearances leave a lot to the imagination, which is perfect for a girl like me. I imagine Eladriel to be the mysterious, good-looking guy, with ruffled blonde hair, emerald green eyes, and the hottest smile. I am blessed, as I have this beauty of an archangel. He’s also a great unit in pretty much everywhere, so I’d definitely recommend this guy if you want a great healer/reviver with the added bonus of being hot. When I first thought of doing this list, literally the first thing I said to myself was “Guillaume needs to be on this list.” Honestly, though: This list wouldn’t be complete if I didn’t put this gentlemanly Phantom Thief on my list. This guy is one of those scenarios where somehow, for some reason, this one monster is really hot but the exact same character model but just with different colors can’t even compete. This is another one of those monsters that I do not have on my island, which is a shame, because, honestly, not only that, I kind of think his skill set is pretty decent, like most of the other monsters here. His passive skill, Elaborate Plan, increases his critical damage by 50% and decreases the chance that he gets hit with a critical hit by that same percentage. I remember there being a Hall of Heroes for him a few years back, but I was unlucky enough to not be playing then, and when it was the Hall of Heroes anniversary number two, it was the old format. I wanted to put Laika here, but I realized that I have zero water monsters, and I personally think Chow is better when it comes to usefulness. However, I could be biased about the usefulness about Chow, as I use him (through a friend’s rep) the most in Faimon Volcano. He and his brothers look mostly the same, so I can only comment on their general appearance. Their helmet hides most of their face, which, like Eladriel, leaves a lot to the imagination of obsessing fangirls. I especially like how his passive skill heals him no matter what. It’s almost like Camilla’s passive skill, so I don’t know which of the passives I could consider to be the better one of the two. The competition was between him and Nyx. I chose Psamathe because, even though Nyx has those really cool scars down his eyes, Psamathe is way better than his dark counterpart when it comes to skills. The main selling point for me, in terms of attractiveness of Psamathe over here, is those WINGS. Seriously, Com2Us did a great job designing the wings on this specific monster species. On top of that, the reason why I chose Psamathe instead of Nyx (come to me baby, I promise I won’t put you in storage) is because of his passive skill. For those who don’t know, his passive skill allows him to, at the moment of death, revive with some HP, and then inflict massive damage on all enemies. I’m normally not a muscles girl, but I’m willing to make an exception for Veromos. Let’s be honest, though: Is there a girl that plays Summoner’s War that doesn’t really crush on Veromos? There is something about Veromos that I find hot; perhaps it’s his eyes, hair, or even the muscles. But whatever the case is, if I were single and prowling for a hot Ifrit to date, I’d definitely go for him first. This monster is also a must-have for anyone that’s early, mid, or end-game to fuse. Of course, because I am the worst Level 50 Summoner to date, I have yet to fuse him and I’m still working on it to this day. For the few people who don’t know Veromos, he’s a fusion-only monster, and his third skill literally cleanses any debuff he may come across and heals him in the process and gives him another turn when that happens. That’s why I rate Veromos #3 on this Top 10 List. First of all, his bright hair and yellow eyes are a stark (and quite frankly, a nice) contrast to his dark skin, so there’s that. I’m also quite fond of the more serious guys, which I can conclude from Baretta’s expression. He’s also really good in Trial of Ascension – or pretty much everywhere. His third skill, Phoenix’s Fury, inflicts Continuous Damage twice and it stays for three turns, along with his second skill, Turbulence, which also sets one enemy’s attack bar to 0. The best part about him is that he can also be fused, which means that if you have a Fusion Hexagon, you can get a Baretta, too. 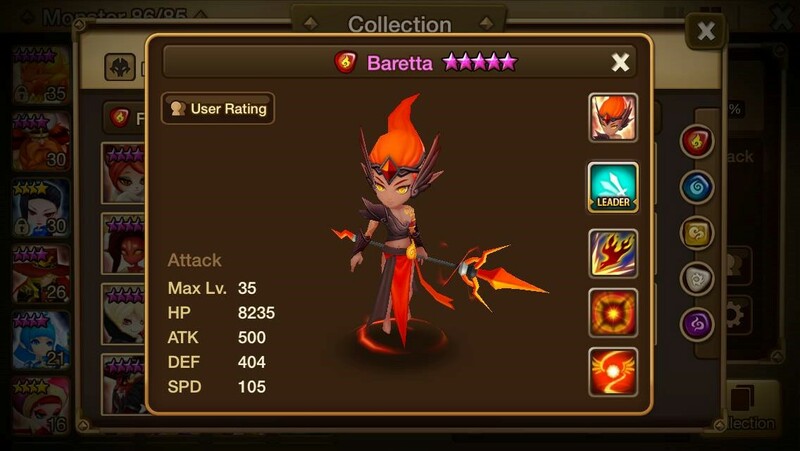 Of course, because, as I said before, I’m the worst Summoner’s War player ever and I have yet to fuse Baretta. Lord have mercy on my heart. About a year ago I got this pretty Pirate Captain awakened from the Wishing Well. Ever since I’ve had a trophy monster and my life in pretty much every dungeon that I can think of so far has been pretty much a lot easier. His shirt is half-open just gives you just a glance of the things you want to see, the scar on the right side of his face one of the hottest things ever, and those eyes. I know that more people like Galleon better, but frankly, this is the only Pirate Captain I’ve had for a while, and I’ve developed a major crush on him since. On top of being super hot for reasons that not even I can explain, he’s also the second-best Pirate Captain, next to Galleon. His third skill, Full Speed Ahead, increases all the party’s attack bars and also decreases their cooldown on their skills. He is a beast, especially in Trial of Ascension when paired up with Mav. Also that transmog. Because of all of these reasons I’ve just listed, I consider him the number one hottest male character in Summoner’s War as of writing this. I hope you all enjoyed reading this article (I know I had a blast writing it), and to stick around for more. This is Sara Ann, and I’ll see you in the next Top 10 List.